Hollywood Gothique went up north this weekend, to explore the joys of Halloween in the Bay Area, particularly the Winchester Mystery House Fright Nights in San Jose. You can ready our behind-the-scenes interview here; a review and video will follow. 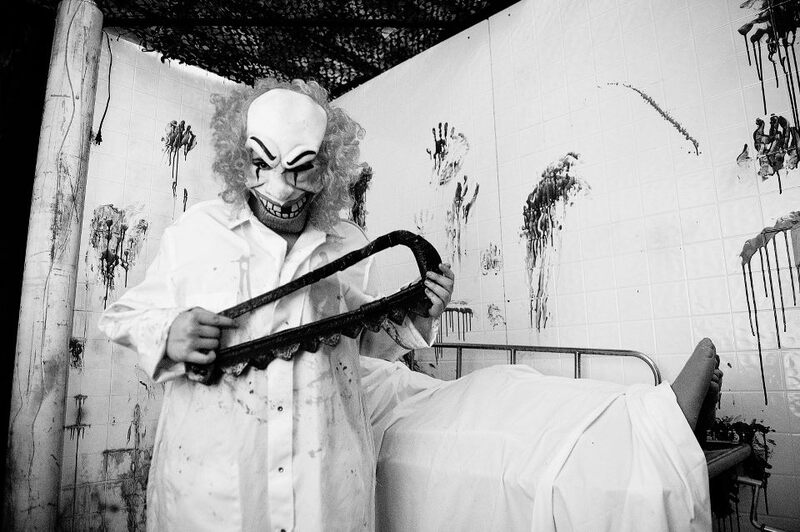 Before we get to that, however, we want to shine our spooky spotlight on a smaller haunted house attraction in Brentwood, called Sanctuary of Fear. Set up in the retail space of a mini-mall in the quiet suburb (about 90 minutes east of San Francisco), this new attraction packs quite a few (un)pleasant surprises into its relatively modest space, creating an enjoyable local event with a home-grown aura - sort of the Halloween equivalent of a farmer's market that encourages you to purchase locally grown food at reasonable prices, instead of driving miles away to spend more money at the corporate-owned supermarket. 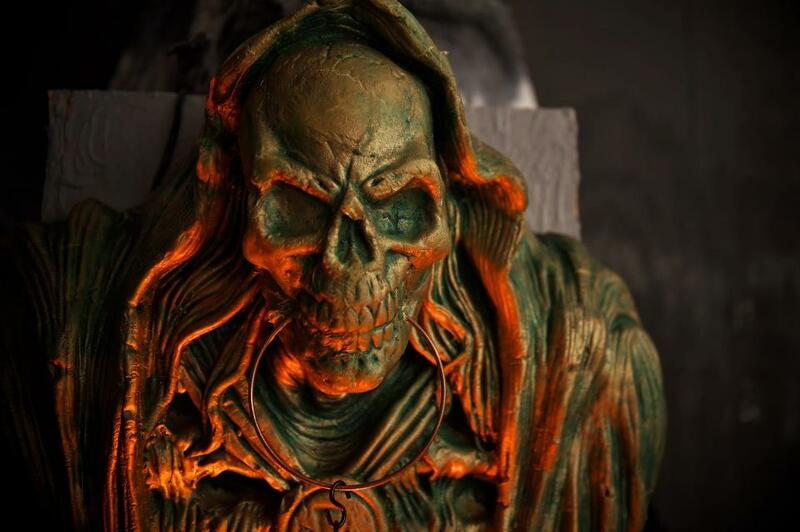 Sanctuary of Fear is a new professional haunted house attraction, making its debut this Halloween, but it previously existed in amateur form as two separate yard haunts, Sanctuary of Evil and Fear the Night, which combined forces. The yard haunt origins are still evident the settings, many of which consist of corridors fashioned from simple, painted flats, but there are many professional-grade, custom-made effects inside. We were immediately impressed with the very first gag: a door with a window displaying a maniac trying to ax her way out to get to us; the use of video to display a piece of action through a window was not new to us, but this bit goes one better: as the ax hits, you actually see dents from within on the "metal" surface. After that we encountered some familiar scares (such as creepy kids and a claustrophobia tunnel), but Sanctuary of Fear continually surprised us with a simple but effective strategy: including multiple scares in most scenes. Just when you think you have experienced what the room has to offer, something else pops out at you. Our favorite bit comes near the end: a fairly extended scene with a doctor performing plastic surgery on (presumably) unwilling victims. There's a bit of pre-recorded dialogue, to which the masked actor lip-synchs, and as elsewhere, there is more than one scare: a victim who pops out through a cubbyhole, only to be pulled back by an unseen force; a thrashing emaciated animatronic; and the doctor himself, who gives up on his current project and turns on you as if selecting his next victim. If that is not enough Halloween horror for you, there is a coffin ride outside, for an extra charge. (After you climb inside and the lid closes, a motion-simulator and an audio track combine to make you feel as if you are being driven to the cemetery and buried.) We certainly would not suggest that Los Angeles fright fans head up to Brentwood just for Sanctuary of Fear, but those in the neighborhood will find it offers great value for the money, filling a niche in an area whose only other concession to the season is pumpkin patches. And watch out for the yeti! 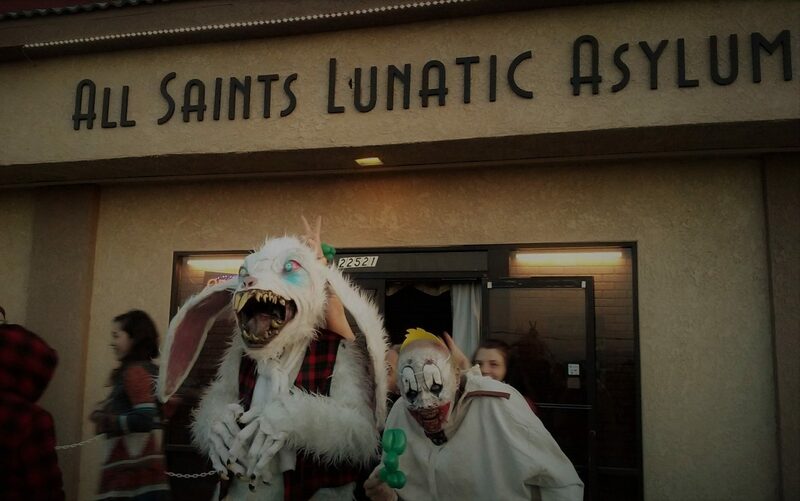 Sanctuary of Fear is located in the Sunset Plaza at 7750 Brentwood Blvd., Brentwood, CA. Remaining dates are from October 26 through November 3. Hours are 7-9 pm. Tickets are $10. The coffin ride is $3. A hat tip to Haunted Bay, where we learned of the existence of Sanctuary of Fear. Those not interested in a trip up north should visit our page devoted to Halloween Haunts in Los Angeles.